Our SH650 Series provides an environmentally friendly and user friendly desktop monitor solution for your business. 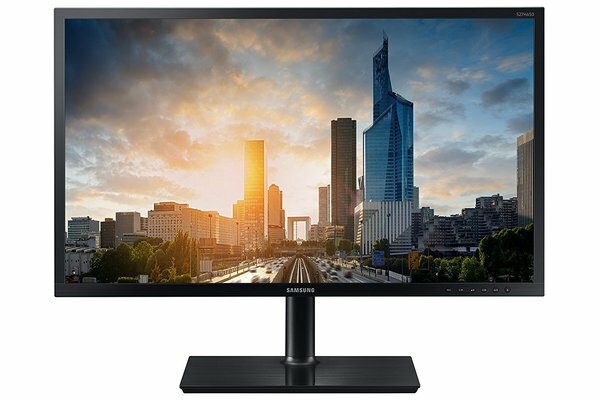 This 23.8" monitor has a Samsung PLS panel for applications that require better image quality than a standard TN-based monitor. And with improved panel technology, your employees can enjoy a better viewing experience at off angles. This is combined with a fully adjustable stand, matte black bezel with clearly labeled buttons and versatile connectivity. With approximately 20% recycled plastic, less than 0.005W off-mode power consumption, Eco features to reduce power consumption when the monitor is in use and fully recyclable packaging, this is the perfect monitor for the environmentally-conscious business. The Samsung PLS, LED-backlit LCD screen delivers sharp, bright and beautiful images. Mega infinity dynamic contrast ratio helps to ensure subtle detail even in the lights and darks, and MagicAngle technology delivers quality color even when viewed off-angle. VGA, Display Port, HDMI and a USB hub interface provide flexibility in high-speed, as well as legacy, connectivity. So whatever devices your employees need to connect today or in the future, this monitor keeps everyone’s options open.